Still image from Frances H. Holocaust testimony, January 24, 1990. 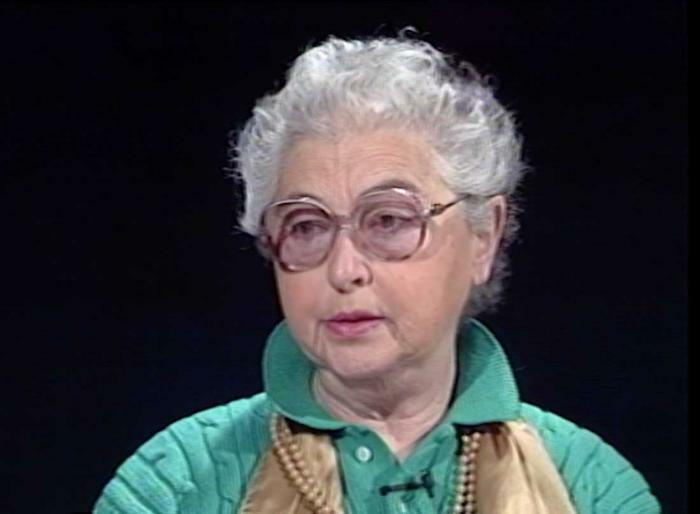 SynopsisFrances H. was born in Mohács, Hungary on December 1, 1918. She describes her family. She describes the Jewish community. She discusses her education and not being able to attend university due to anti-Jewish regulations. She recalls moving to Budapest with her family. She describes her husband and their marriage. Frances recalls how her husband, father, and brother were all taken for forced labour. She recalls the German invasion and refusing to leave her mother. She describes their arrest by Hungarian police. She describes selection and deportation to Auschwitz. She describes the conditions and food in the camp. She recalls transfer to another camp for forced labour. She discusses making friends with other prisoners. She describes her interactions with Josef Mengele. She recalls liberation by Soviet troops. She describes returning to Budapest and reuniting with her father. She describes reuniting with her husband. She discusses not being ready physically or psychologically to have children at this time. Frances describes how the family received false papers to escape to Vienna after the birth of a daughter. She describes immigrating to Israel and living in Italy, Barcelona, and Paris. She describes immigrating to Canada. She discusses her experience during the compensation process and receiving reparations. She notes her continued friendship with her concentration camp friend. She discusses her relationship with her daughter and sharing her experiences.